I talked yesterday about all the “questionable” Chinese “too good to be true” harp guitars from Tropical Moon (and/or others operating under constantly changing eBay monikers). Amazingly, alongside those instruments are 2 actual “too good to be true” China-made instruments – one, a harp guitar, and one, a whole line of multi-string guitars. No, I’m not affiliated with Holloway in any way, other than as a eventual dealer. But I know the two constant questions: How much? and When? The answers are still TBD. No matter what the price points are, they will be cheaper than the Larks, with a quality case included. And I won’t be rubbing it in on the commercial Harp Guitar Music site when I list them, but can give you my 2 cents here: They are an exponential order of magnitude better in every possible way. I expect to have some available any week now (knock wood). Yesterday, Javen wrote about 3 instrument options. The baritone guitar option is beyond my scope, but the other – 10-string guitar – is appropriate, though things are going to get a bit complicated. “The guitars are made in Guangzhou, China, in a western-trained factory that also makes OEM classical guitars for other well-known classical guitar brands. There are several dealers around the world. Neris is based in Madrid, and I am the USA dealer for multi-strings, and there are other dealers in a few other countries. So why am I giving so much blog space to 10-string guitars and Stephen Bright, my “sworn, harp guitar enemy”? (that’s tongue in cheek, for any irony-challenged readers). Because Javen asked about the option in his original email and I wanted to acknowledge this excellent alternate option for musicians. So far, there are no low-budget nylon-string harp guitars (though there will be one day, I bet). A lot of people ask me, and I always recommend old Vienesse kontra-gitarres as one option, and trolling the luthier list for those who have built nylon-string HGs (there are many). The latter are not usually in the $1500 range of course (many kontras are, but you have to know what you’re getting). I do not recommend 10-strings or other multi-strings – simply because I can’t. They are not harp guitars. And harp guitars is my sole business. It’s also the sole topic of Harpguitars.net. My site, of course, goes into many different harp guitar “cousins” and legitimate relatives, but labeled as such, for point of history, and point of comparison. 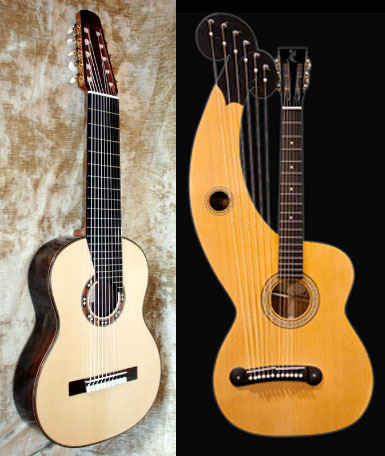 You may have noticed that the Bartolex 10-string is shown in two different Harpguitars.net Galleries: Extended Range Guitars, and Fretted Harp Guitars. How? Why? Very simple: Because this same 10-string instrument can be used in two specific ways. One is as a standard multi-string, where all ten strings are fretted by the left hand as needed musically. The other is as in a harp guitar, where the lowest basses are never fretted. That’s how Stephen plays it. He never (he swears to me!) frets the last couple strings, and so chooses to call himself a “classical harp guitarist” and his instrument a “10-string classical harp guitar.” This site’s readers know that his term is organologically incorrect, but my concern is that the term will only serve to confuse the public to their detriment. You can play it “like a harp guitar” all day long, but at the end of the day, it’s still not a harp guitar. It has to have floating strings. But Stephen (a long-time internet friend) and I have been all over it, and decided to live and let live (at any rate, it is apparently a free country…). However, there is a category to put Stephen’s (and others’) version of a fully-fretted instrument where only open notes are used on certain strings, and of course (like defining “harp guitar”), I had to create that category: Fretted Harp Guitars. Yes, the term seems an oxymoron, but it is nevertheless simple and legitimate. Because many builders and players have also created such an instrument. And for purposes of clarity, this “performance practice-driven” classification had to be acknowledged and defined (the definitions of each Gallery are at the top). In the case of Bartolex instrument(s), they belong in the Extended Range category for the most part. For Stephen’s same 10-string, we place it alternately in the organological category Fretted HGs – the intent of the performer becomes the defining parameter over form or construction. Fascinating, huh? Believe me, this musicology concept-crunching has taken me years and zillions of hours. It isn’t easy. But as always, someone has to do it! One last caveat, and it’s important and serious: Stephen wanted to come to the Gathering to show and sell his 10-string guitars. I welcomed him to come for the weekend, but to keep the instrument in his room. We are The Harp Guitar Gathering, plain and simple. That’s the whole point. Yes, it’s a nit-picky organological point that keeps this instrument out (it literally would just need one floating string unfretted! ), but as Stephen admitted, “I do understand your need to draw the line, though, and unfortunately these guitars land just on the other side of it.” He also thought they’d be of interest to the harp guitar world, and that’s true – that’s why I’ve discussed them (at length!) here, for people like Javen who can’t decide whether to try one or the other. The 10-string classical guitars are certainly great options for those wanting nylon strings. But for those wanting nylon strings and a harp guitar, you’ll have to look further. Floating strings rule! Just one, Terry. I thought I was supposed to be the smart aleck (it is my blog, after all). But that’s OK – I’ll post your rather bold challenge to the harp guitar community. Terry’s instrument thickens the plot even more than he thinks. His is the one that took me quite awhile to get to the bottom of a year or so ago, when the builder of Terry’s first 11-string (or first two? ), George Smith, asked to be added to the site’s Luthier page. Finding photos and information on all these new 11-strings became confusing, especially after leading to Kenny Hill Guitars, who build a “Schumacher” model. Terry, we’d love decent photos of all these models – and I’ve only ever seen this one photo of you…no web site? Apparently, Ken first made instruments like Smith’s which features a couple fully floating low strings (2? 3? I haven’t been able to get decent photos). But the model now has been standardized to include a single fret across all 11 strings. Nothing wrong with that, right? No, just the tedious explanation and clarification I have to include in writing up such instruments! These 3 models have been on the Luthier page for some time, with just these caveats (see Hill under Dedicated, and Smith under Occasional). But seriously, there’s no black and white. Here’s the fine point, and I harp on this constantly. One doesn’t (and needn’t) call or name Terry’s instrument a “harp guitar.” We only classify it as harp guitar, and only within the context of this site, which is concerned specifically with harp guitars. We call it exactly what Terry has named it, an “11-string guitar.” Or more specifically, the “Schumacher-style,” if we must. We can classify it or group it with other instruments in any of a number of ways (I’d classify it foremost as an “extended range guitar,” myself). But typically, no one bothers (nor perhaps need to) with grouping or classification of new variations of instruments. They just are. If the harp guitar community wants to discuss the instruments, then we’re forced to use our definition – so let’s just have fun with it. In this case, the original Smith 11-string shown on the Luthier page certainly qualifies as a harp guitar. But Kenny’s new model with just that one full fret? Well, that is a Maxwell Smart “Missed it by that much” almost-harp guitar if I ever saw one!